Let your imagination loose in this sandbox world. Reviewing a sandbox game is always a tricky endeavor. First, you have to abandon the usual yardsticks of game evaluation: its length, its challenge, and the satisfying nature of its objectives. 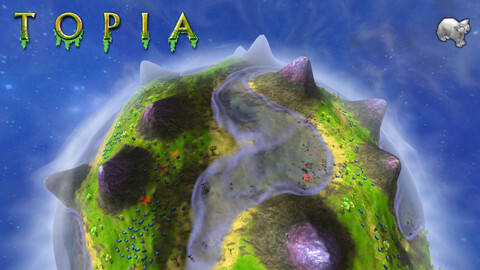 Secondly, your enjoyment of Topia World Builder will come down to a very subjective evaluation that reflects how much you're prepared to give to it, rather than take away. Fortunately, the game has one thing in common with the guilty pleasures we all secretly harbor about videogames: it looks bloody fantastic. Greens, blues and purples blend together as you create sky-high mountain ranges, while more peaceful valleys and sandbanks can be carved into the ground. You will unashamedly tease and rotate at the planet to take in your masterful handiwork. You do all this with some very accomplished controls. Finger swipes rotate the planet, pinch-zooms bring you nearer to or further from the planet, and there's a series of icons that allow you to shape what's happening on the ground with precision. With one tool you can raise a mountain range with a finger smear, while another allows you to carve out a valley, changing the flow of water around the landscape. The strength of these tools can also be increased or decreased, allowing you to etch some finer detail into the planet. It all adds up to a very satisfying sandbox world that truly becomes your own. 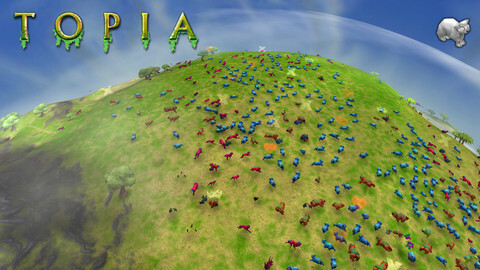 A world without wildlife would be a pretty boring one, and so you can also populate it with a variety of animals, some predators, some prey. A delicate balancing act ensues where you have to carefully manage the numbers of one species to prevent the total annihilation of another. You do this not because there's a reward for doing so, and not because the game even acknowledges this (it doesn't), you just do it because it feels like the right thing to do. We'd have liked to have seen a little more variety in that wildlife though, as there's only a very limited selection of creatures. Still, this is a game that's ripe for building upon and we can only hope that it's successful enough to warrant future updates that flesh the world out even further. 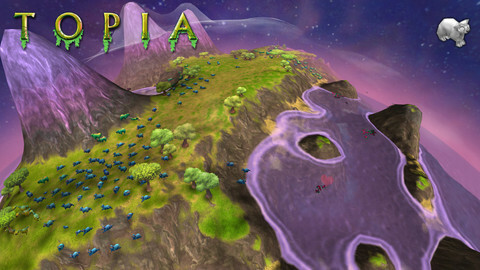 Topia World Builder is as fine a toy as any videogame out there, and is just as deep as your imagination is prepared to travel. If you need at least some direction in your gaming, you may be frustrated before you uncover its wonders, but for those who are prepared to dig a little deeper the game has plentiful treasure to be unearthed. What's Hot: A very accessible sandbox game that's more than a little easy on the eye. What's Not: More content to put in the sandbox would make for a very welcome update.